This is post 26 of 31 for the Blaugust event. To check out more Blaugust posts and sign up to participate, visit the Blaugust Nook! Chaide and I finally hit thirty tonight in Final Fantasy! Last time we played was way back when I bemoaned the fact that we were stuck at level 29. Tonight, however, thanks to Sylver (a WildStar guildie who’s playing over with Greysky, now) and Keryn, we moved beyond that barrier! We logged in, thinking we’d do some quests over in Little Ala Mhigo, but Sylver told us that if we wanted to run a dungeon or two to let her know. 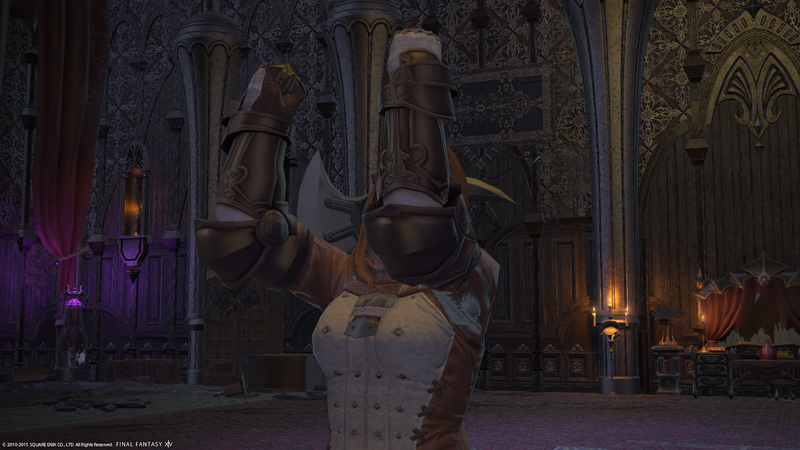 She’s been working on various classes and thought it’d be fun to run a dungeon with us, especially since she’s loving the Black Mage to death. So Chaide and I decided that since we were so close to level 30 that running a quick bit of Haukke would get us there. And it did! I still don’t know the dungeon all too well, but thanks to Keryn, I think I could do a better job finding my way around and taking care of the pulls. Chaide and I also ran a second dungeon later this evening to help Sylver get her healer leveled. We ran a quick Copperbell with her and Deafening (another WildStar guildie who’s playing over with Greysky–he’s been playing the game for quite a while and transferred over), and helped her level her healer about one and a half levels. It was great to spend time with them in a slower-paced environment than WildStar. Don’t get me wrong, I love WildStar, and it’s my main game at the moment. But it’s such a frenetic pace, sometimes, that it can be difficult to take it easy and just laugh and BS with each other. So that’s what we did, tonight. We also did our level 30 quests for our main classes, but that’s a different post for tomorrow. Next on the agenda: get Gladiator and Conjurer up to level 30! Well, after doing the anniversary event tomorrow evening!